Planning was a hallmark of the New Zealand Company settlements. The company’s founder, Edward Gibbon Wakefield, had a vision of rural society supported by towns. 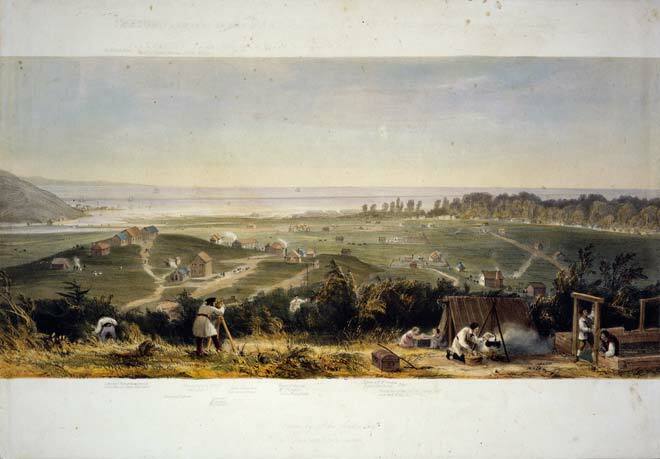 Images such as this view of Nelson in 1842 were used to promote his ideal to prospective immigrants. The settlement is evocative of an English hamlet, with groups of houses and dirt tracks meandering over fields. In the foreground a surveyor and assistant run a line, while workers construct a new house for a family living under canvas.